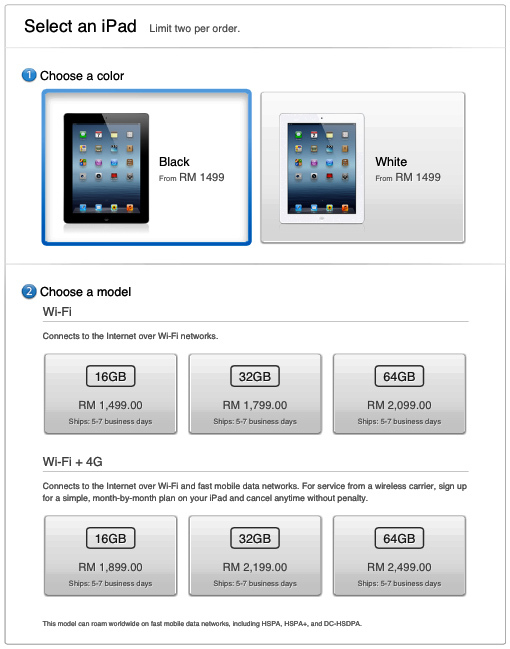 Official pricing for the new iPad (iPad 3) for Malaysia has been released today, Friday 20th April 2012, by Apple.store.com. The initial prediction via extrapolation in my recent article overstated the prices by a small margin. But that made this official price release more of a good news than a bad one. The following is the snapshot of apple.store's iPad page for everyone's record. You can also go to their website and order online. There is an ordering lead time of 5 to 7 business days. It stated in it's advertorial that this gadget is 4G LTE capable. While the specification is true, 4G LTE is supported only on AT&T and Verizon networks in the United States, and on Bell, Rogers, and Telus networks in Canada. Not in Malaysia. Nevertheless, if our cellular network infrastructure can handle a bandwidth of up to 40Mbps, then you can still get a pretty fast surfing experience. Even the current wireless speed of 7.2Mbps is at 'best effort'. I rarely get more than 4Mbps on my Maxis broadband. Note: Most outlets offer free smart cover, leather or other material of equivalent cost, and screen protector. Update @1 May, 2012: I finally received my unit, a 32GB Black WiFi+ 4G, for RM2,340.00. Not a very fair pricing, IMO, considering the published price of only RM2,199.00 at apple-store/my. Apparently Technocrats don't keep stock of the WiFi + 4G version (until further notice??). You can try your luck at the many mobilephone shops in the city. nak tanye kt mane nak beli? a different style. Then once more, Apple has tight control to the retail front. You might want to check out the iPad Mini which is going to launch soon. The smaller sibling of the current iPad will have all the capabilities of iPad but cheaper, thus is a perfect present for this holiday season. So if you ask the kids what they want for Christmas, they'll probably tell you its the "iPad Mini".